Growing up in Eastern New Mexico and the Texas Panhandle it was not uncommon to see messages across the land via church signs. Some were funny, some were serious but they all conveyed a love for the people. Now that live out in the Wild West of Las Vegas, NV there are fewer church signs to inspire but I have one on my way to and from our local shopping corner. Its a little Baptist church who just recently celebrated 50 years and I just love their signs. Today I came across an image online of a church sign that just made me chuckle so I thought I would share it with you. 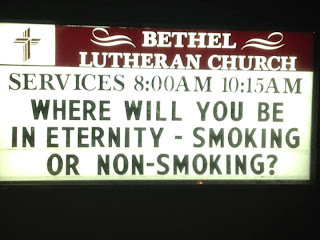 Being a non-smoker it was humorous but more importantly being a child of God it was spot on! 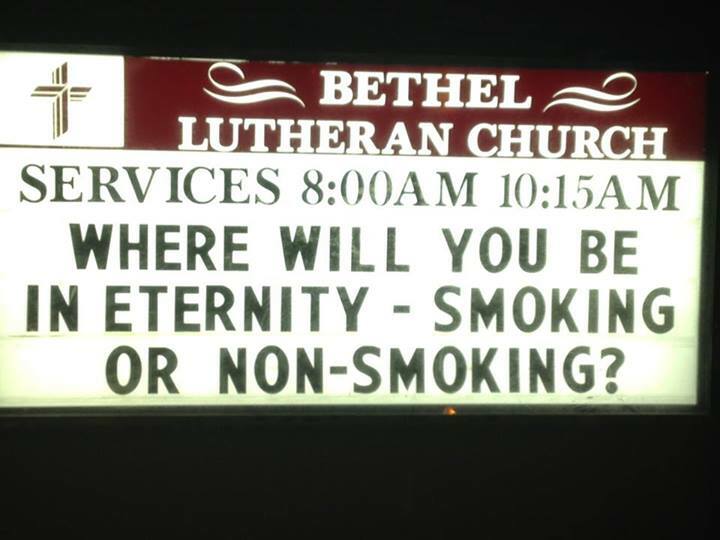 I am a non-smoker for eternity! From time to time as I come across signs I like I'll post them below! Until we meet again, blessings to you my friend!